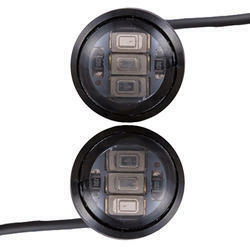 Leading Wholesale Trader of autofy bike strobe lights and autofy bike number plate light from New Delhi. 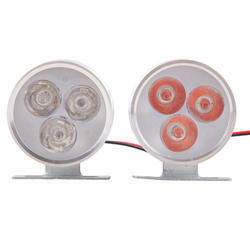 Autofy LED strobe lights are best in the market and now available at a very and reasonable price. These lights have two colors, Red and Blue which when connected glow in flashing mode also known as strobe mode. The lights have 3 LEDs fitted to give a bright and crisp light. This pair has a very easy installation process where they can be connected to the brakes or via a switch. When connected to brakes, the lights glow when you apply brakes giving an indication to the people driving at the back of your activity. The lights have been designed carefully to consume very less power and dissipate heat which gives it a very long lasting life. These E marked lights have a faster response time and made of die casted aluminium making it shockproof and able to withstand unfavourable weather conditions like rain, fog, mist, dust etc. This is the best product for any rider going for highway rides, mountain rides, leading a bike gang etc. This is one preferred product of the biker boys and many bike riders having Royal Enfield Bullet Standard 350, Royal Enfield Bullet Standard 500, Royal Enfield Bullet Classic 350, Royal Enfield Bullet Classic 500, Royal Enfield Bullet Classic Desert Storm, Royal Enfield Bullet Electra, Royal Enfield Bullet Thunderbird 350, Royal Enfield Bullet Thunderbird 500, Avenger, Pulsar, Duke KTM, Harley Davidson, Yamaha FZ, R15, CBR, Ninja, Apache, Hayabusa and other bikes. The lights have machine gun design and are very strong to withstand extreme weather conditions and shocks. The carefully engineered design consumes very less power ensuring no battery drainage. Autofy stylish Number Plate light with 3 LED fitted inside is now available at a low and reasonable price. These indicators Number plate lights can add style to any bike / scooter (geared and non-geared) of any model. It is made of premium quality plastic with consumes very low battery power giving it long life and faster on/off response time. The installation process is very easy, directly mounted bolts connected to wire harness offers plug and play functionality. Each LED fitted both the sides to add more effects and style and it comes with Red colour to provide a clear and bright light for better visibility. The mechanism does not drain battery because of the low power consumption technology thereby giving your bike a healthy and long battery life. This is a must have accessory for biker boys having Bullet, Royal Enfield Classic 350, Royal Enfield 500, Thunderbird, Royal Enfield Twinspark, Avenger, Pulsar, Duke KTM, Harley Davidson, Yamaha FZ, R15, CBR, Ninja, Apache, Hayabusa and also other bikes.